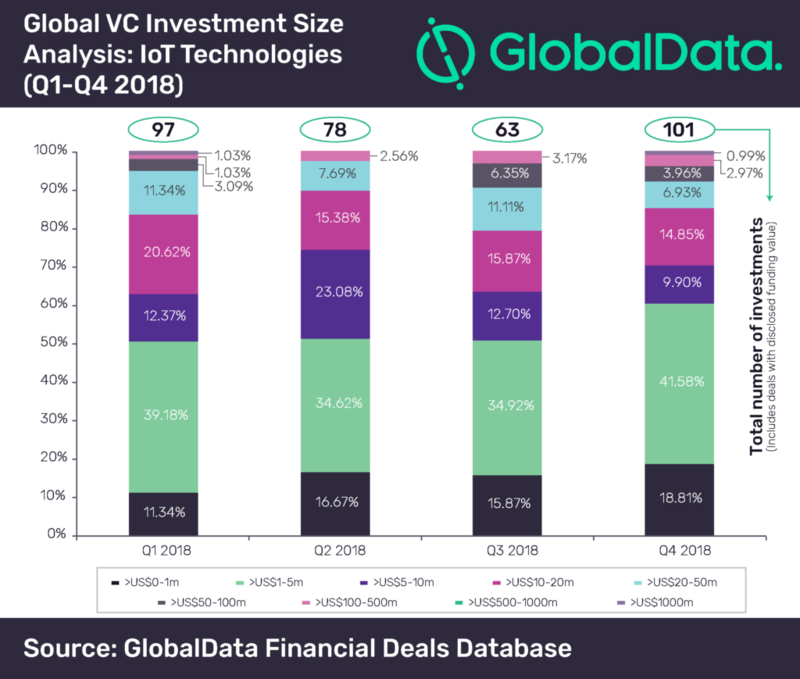 Venture capital (VC) investments in the Internet of Things (IoT) space experienced a fluctuating trend in 2018, as the share of deals valued <$5m mostly grew while the deal volume registered inconsistent growth during the year, says GlobalData, a leading data and analytics company. Overall deal volume witnessed decline in Q2 and Q3 2018 before returning to growth in Q4 2018. Low value deals (investment <=US$10m) continued to dominate VC investments across all the quarters in 2018. In total, 230 VC deals in the IoT space had disclosed deal value of <$10m, which accounted for 67.8% share of the total deal volume in 2018. Within low value deals, all the four quarters registered the highest number of deals valued between US$1m-US$5m range. In Q1 2018, 61 deals were low value deals, which accounted for 62.9% of the total deal volume. The quarter witnessed 38 deals valued in the US$1m-US$5m range while two deals were valued more than US$100m. Among all the quarters, low value deals as a percentage of total deal volume was the highest in Q2 2018. During this period, 58 such deals were announced, which collectively accounted for 74.4% of the total deal volume. Only two deals valued more than US$100m were announced during the period. Deal volume declined by 19.2% in Q3 2018 as compared with the previous quarter. Overall 63 deals were announced during this period, which was the lowest among all the quarters in 2018. A total of 40 deals with value up to US$10m were announced during this quarter, accounting for 63.5% share of the total deal volume. This quarter also witnessed two deals valued more than US$100m. Among all the quarters, Q4 2018 witnessed the highest number of deals. Deal volume increased by 60.3% in this quarter as compared to the previous quarter. Q4 2018 also witnessed the highest number of low value deals, among all the quarters. A total of 71 such deals were announced, accounting for 70.3% of total deal volume, during the quarter. The quarter witnessed four deals valued more than US$100m, which was also the highest among all the quarters.